You can manage one or more alerts at a time using the ACTIONS menu. You can use the ACTIONS to change the status of or dismiss an alert. Select an alert by clicking on empty space in the alert row. The Alerts UI displays a panel listing the status of the alert all available data in Elasticsearch about the alert. The current alert status is highlighted. To manage more than one alert at a time, click the check boxes at the end of alert rows, then select the action you want to perform from the ACTIONS menu. Click the new status you want to apply to the alert, then dismiss the panel. You can also add a comment to this action by clicking (Comment button), entering your comment in the Comments field, and clicking ADD COMMENT. 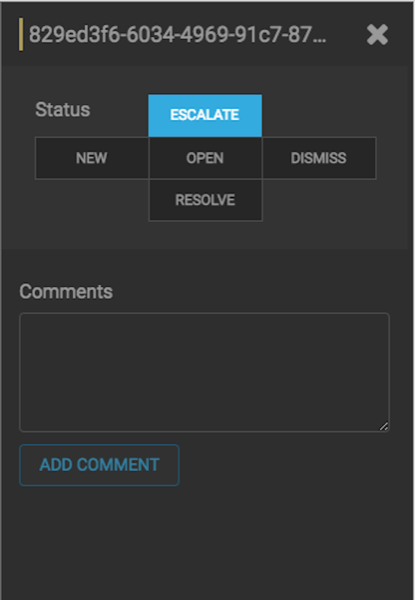 The Alerts UI indicates that an alert has one or more comments by displaying (comment icon) next to the alert status in the Alerts window. You cannot add a comment to an alert contained in a meta alert. You can only add comments to the meta alert. To delete a comment, click the comment to delete, then click the trash can icon. Click OK in the Confirmation dialog box.